Welcome to the exciting world of Cowboy Action Shooting. We at SHOOT! Magazine, want to help you get off on the right foot as you begin your Western-action shooting experience by offering as much relevant and timely information to beginningCAS shooters as we possibly can. Below is a brief overview of the basic how-to and what’s needed information that you will need as you begin your CAS shooting experience. The first thing we recommend that you do is to try to find a local match to attend to see how it’s done, and to let the shooters there know you are interested. Check out our Cowboy Action Shooting Events Listings, which covers the various cowboy action shooting events and can help you find a club and/or shoot near you. Information gathered while attending a local match will take you a long way in your quest to get set up for cowboy action shooting. Cowboy action shooting is the fastest growing shooting sport out there right now. The nostalgic appeal of the Old West, shooting originals or replica firearms from before 1898, and dressing up as cowboys or cowgirls is just plain fun! Though many are competitive in this sport, most of the people participate solely for the purpose of having fun. Some don’t even shoot, but like to dress up, especially at the Saturday night balls, and play the part. Four firearms are required to participate in cowboy action shooting: a period correct lever-action rifle with hammer firing a pistol cartridge, two single-action revolvers, and a period correct shotgun, either a double-barrel without ejectors or a hammer pump or lever shotgun. Naturally, you have to dress the part with the appropriate clothing for the period. Events for this sport are currently conducted in every state, as well as Canada, New Zealand, Australia, and many other countries. Stages are designed for the competitors and provide a shooting area allowing a variety of shooting positions, normally three to four, as well as a loading table and unloading table. The loading tables are usually facing into berms while the shooting area is facing down range. Stages incorporate false front buildings, church steeples and bells, hitching rails, cooking fires, bathtubs, forts, mine shafts, jails, and almost anything your imagination can come up with. Scenarios are developed for shooting each stage. The scenarios normally include the use of a rifle (using a pistol caliber), a shotgun, and two single-action sixguns. You may start at one position on the left and shoot the rifle with ten rounds at five targets twice from left to right, then move to a doorway to shoot the sixguns in a Nevada sweep at three targets twice (Nevada sweep is shooting at targets: 1, 2, 3, 2, 1). You could run to the hitching rail down to the right (after safely holstering your sixguns) and pick up your shotgun and shoot the four knockdown steel targets from the outside inside (1,4,2,3). Naturally, to develop different scenarios the designer can move any gun or position order around, as well as the order the targets are shot. This provides the capability for multiple shooting scenarios for each stage. Safety is the most important aspect of any type of shooting. Safety cannot be over-emphasized when handling and shooting firearms. Any time you are at an event, either as a participant or observer, you will be required to wear eye and hearing protection. When shooting steel targets with lead bullets there should be a degree of expectation that small pieces of lead bullet may strike the shooter or spectators and while there is practically no possibility of serious injury to the skin and clothed parts of the body, the eyes are particularly vulnerable to injury from flying objects regardless of size or velocity. While on the firing line, the shooter must always maintain the 170-degree safety rule (an imaginary line that is five-degrees inside the straight 160 degree firing line). The muzzle of any firearm cannot cross this 180-degree line at anytime, potentially “sweeping” other participants or spectators. All firearms must be loaded at the loading table or under specified circumstances (on the firing line) and must be unloaded only at the unloading table. All firearms should be checked by another shooter or qualified observer to ensure that you have loaded the proper number of cartridges at the loading table and that all guns are safely and completely unloaded at the unloading table. Only five rounds are loaded in your sixguns, so that the hammer can rest on an empty cylinder chamber. Always keep the muzzles of your long guns pointed up unless you are on the firing line. Always make sure you have the correct caliber of ammunition for each firearm. Having both pistols and rifle chambered for the same cartridge will make this a lot easier. Many other safety items apply; so listen carefully to all safety briefings. In all SASS sanctioned events, firearms must be models originally produced before 1898 or replicas thereof and chambered in what is generally referred to as a “pistol caliber”, that being a centerfire cartridge of .32 to .45 caliber that has been historically chambered in a single-action revolver. The Buckaroo category for young shooters from age 8 to 12, allows the use of pistols and rifles chambered for the .22 rimfire cartridge as well as allowing the use of .410 bore shotguns. Firearms forcowboy action side matches will vary based upon the side match. 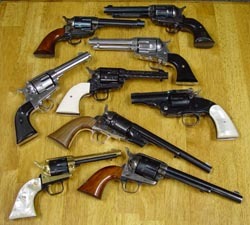 A variety of sixguns are used for cowboy action shooting. Top to bottom: Ruger Vaquero in .45 Colt with custom grips, a Navy Arms charcoal blued .32-20, a Power Custom coltinized Ruger Vaquero in .38-40, a stainless steel Ruger Vaquero in .357 Magnum with Eagle ebony gunfighter grips, a third generation Colt in .45 Colt engraved by Dale Miller with Eagle Grips imitation ivories, a Navy Schofield Wells Fargo model in .45 Colt with Eagle Grips pearl grips, a American Frontier Firearms 1860 conversion in .44 Colt, A Colt Frontier Scout in .22 Long Rifle for the Bucakroo category (young juniors) and a Cimarron model P in .44-40. – One (1) Lever-action or exposed-hammer slide-action RIFLE, chambered for a pistol caliber (although not required, it is recommended that you use the same caliber as your sixguns). Top to bottom: A Taylor’s 1866 Yellow Boy rifle in .44 Special and engraved by Dale Miller, A Browning 1892 Winchester carbine in .357 Magnum, an original Winchester 1873 rifle with octagonal barrel and tang site in .44-40, A modern Winchester model 1892 in .45 Colt, a Cimarron 1873 Winchester in .45 Colt with a short stroke kit and action job by The Cowboy and Indian Store, and a Rossi model 1892 Winchester imported by Navy Arms in .45 Colt. 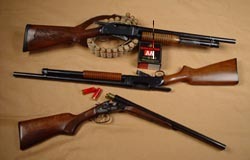 – One (1) exposed-hammer pump, lever-action, or side-by-side double barrel SHOTGUN. 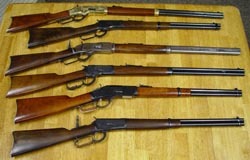 The 1897 Winchester pump-action, the 1887 Winchester lever-action, or the 1978 Colt exposed-hammer double barrel are good examples of each type. Any side-by-side double barrel shotgun (with or without exposed hammers) chambered to take 10-gauge, 12-gauge, 16-gauge, or 20-gauge shotshells and utilizing extractors only (ejectors are not allowed) may be used. Iron sights on all firearms are required. Just as in sixguns and rifles, there are numerous shotguns available. Displayed from top to bottom are: an original 1897 Winchester 12-gauge with original wood, a original 1897Winchester 12-gauge that has been refurbished to include re-bluing, and new stock and forearm, and a EAA Bounty Hunter SASS double-barrel 12-gauge hammer coach gun made by Baikal in Russia . Cowboy Action Main Match Ground Shooting: Cowboy action shooting uses “live” ammunition. All rifles and pistols must be chambered in calibers that are commonly referred to as revolver or pistol calibers and must be from .32 to .45 caliber and encompass such authentic calibers as .32-20, .38 Long Colt, .38-40, .44-40, .44 Colt, .45 Schofield, and .45 Colt, as well as more modern calibers such as the .38 Special, .357 Magnum, .44 Special, and .44 Magnum. However, there are limitations as to the type of bullets that can be used and the velocities at which they can be fired. Revolver ammunition cannot exceed 1,000 fps, while rifle ammunition must have a velocity less than 1,400 fps. It is recommended (but not required) that the minimum revolver velocity is 650 fps. All bullets must be lead or lead alloy and rifle bullets must be flat-pointed to allow for safe loading in tubular magazines. Jacketed bullets, hollow points, plated, gas checked, and copper washed bullets are not allowed. Commercial factory ammunition is readily available for almost all calibers in both smokeless and black powder versions or you may choose to load your own. Cowboy Action Side Matches: Ammunition for side matches varies based upon the side match. However, those side matches using revolvers and lever-action rifles for pistol calibers have the identical requirements as the main match. Lever-action rifles chambered in a rifle caliber are generally limited to those calibers available prior to 1898, including the .30-30 WCF. Again, lead, flat-nosed bullets must be used. Some events will have separate categories for smokeless and black powder. The single-shot long-range or buffalo side match is also limited to pre-1898 calibers, with the most common being the .45-70. There are also side matches using derringers and pocket pistols with appropriate ammunition from .22 rimfire to .45 Colt. Many events have incorporated .22 side matches for both revolver and lever-action rifles. Fastest rifle, pistol, and shotgun side matches are standard at most annual matches and ammunition for these events is the same as that used in main-match competition. Shotgun ammunition is generally of the “light-field load” type with velocity under 1200 fps using #4 to #8 hard lead shot. Shot size requirements may vary from event to event. The point is to keep the recoil as comfortable as possible and still be able to knock over any reactive targets you may encounter. 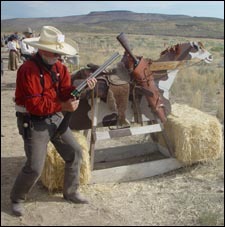 Traditional gun leather, such as period-cowboy gun rigs and Hollywood gun rigs with drop loop holsters, are allowed by SASS (Single Action Shooting Society). However, NCOWS (National Congress of Old West Shootists) frowns upon Hollywoodholsters. Since two sixguns are normally used, you may either wear two straight-draw holsters, cross-draw holsters, or a combination thereof. Please note that wearing a cross-draw holster requires additional safety precautions. SHOOT! Magazine frequently publishes articles about various gun leather makers and gun leather is also available from the SHOOT! Mercantile. Once you have determined that you are going to get involved in cowboy action shooting, one of many decisions that you will need to make is which shooting category you will enter. To date there are nearly 20 different categories that you may choose from. Generally, the most popular and fastest category is Traditional. The Traditional category has the least restrictions with which to contend. Pistols may be any approved single-action type with fixed-sights. Barrel length is unrestricted, any caliber from .32 to .45 can be used and any approved powder is OK also while nearly every Traditional shooter uses smokeless, black powder is also approved. Two hands can be used to hold the gun and any style gun leather is also approved as long as it is safe. Modern category shooters follow the same basic rules as the Traditional category folks with the only difference being that more modern-style single-action pistols with adjustable rear sights may be used. Black powder shooters can find a home in the Frontiersman or Frontier Cartridge categories. The Frontiersman shooters must use cap-and-ball revolvers chambered for .36 caliber or larger and the Frontier Cartridge category allows the use of cartridge revolvers chambered in any pistol caliber from .32 to .45 caliber. All ammunition must use either black powder or one of the black powder replacement powders in all cartridges and shotshells. Only side-by-side double-barrel shotguns are allowed in the Frontiersman categories. In addition to the above mentioned categories, there are the various Duelist categories that require the use of only one hand to support and shoot the pistols, the Gunfighter category that allows the shooter to employ both revolvers at the same time, double-duelist-style firing rounds alternately, and the Classic category that requires the shooter to shoot duelist and has firearm, caliber, and clothing requirements not found in the other categories. When you consider that there are age and gender related equivalent categories for all those mentioned above you begin to see that there are a lot of opportunities out there to find your perfect niche. Regardless of how you want to shoot, there is no doubt a category that will fit you perfectly. Your cowboy action clothes should follow the persona that you want to portray. In fact, there are some shooters that change personas each day of a match. However, don’t feel that you have to spend a fortune on clothes just to get started. Throw on a pair of jeans, a pair of boots, and a cowboy hat if you have them, and if not, don’t worry about it for your first local shoot or two. After that, you may be expected to slowly build up your outfit, although many continue to wear jeans, boots, and a cowboy hat at local shoots. Just check with your local club members to see what is required at their shoots. When shooting in annual matches, period-correct clothing is generally required. Hollywood-style or “B-Western” clothes are perfectly acceptable at SASS events, but not for NCOWS events, which try to maintain a more period correct atmosphere. 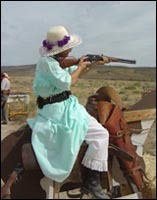 Old West clothing comes in all styles and types for men, women, and juniors. Visit the Shoot! Mercantile for a great selection of both men’s and women’s clothing and/or view the photos in SHOOT! Magazine for ideas. Alias/Persona: Some cowboy action organizations, such as the Single Action Shooting Society (SASS), require you to choose an alias, while others, such as the National Congress of Old West Shootists (NCOWS), do not. A SASS alias is unique to each person on a first-come, first-serve basis. Whichever organization you become associated with, you may want to develop a persona and then select an alias that goes along with it. You might select a type of historical person from the Old West, such as a cowboy, townsperson, law officer, school marm, saloon girl, bartender, scout, or cavalry soldier, and then develop your alias, clothes, and firearms around it. Many people have also selected one of their favorite Hollywood heroes as their alias, such as the Lone Ranger, Tonto, Paladin, etc. Your alias will be used at all SASS sanctioned events. You can find out if an alias is available by calling SASS at (714) 694-1800 . Gun Carts: Gun carts vary extensively. SASS and most other clubs (other than NCOWS), do not have a requirement on what types of gun carts can be used as long as the guns can be carried safely. NCOWS requires more traditional building methods using materials that were available in the 1800s. Rubber wheels/tires are not allowed. Organizations: The Single Action Shooting Society (SASS), and the National Congress of Old West Shootists (NCOWS) are the two main cowboy action shooting organizations in the U.S. Visit our Organizations Links page for the web-sites of these and other firearms related organizations. When was the last time you watched a western movie? Have you ever thought you would like to play cowboy like you did as a kid? Have you ever wanted to take your family or a friend out to an old-time town dinner and dance dressed up in Victorian clothes? What about galloping on a horse with your sixguns blazing? Well, now’s your chance! Western-action shooting is the fastest growing shooting sport in the world. It is friendly, family oriented, competitive, and really fun! Come with us and enjoy the world of cowboy action shooting, buffalo matches, cowboy fast draw, black powder cartridge rifle silhouette, cowboy mounted shooting, and more. Come play cowboy with real guns and ammunition in a safe atmosphere, and bring your family and friends along, too. There are a variety of items that are required in Western-action shooting; however, the most important is your desire and interest, as any local club will be more than happy to help you out with the rest. They will usually even loan you the sixguns, leverguns, shotguns, and other items needed to shoot! So, the first thing we recommend that you do after reading up on the type of shooting you are interested in is to find a local match in your area, attend a shoot to see how it’s done, let them know you are interested, and ask for help. We will briefly cover all of the subjects pertaining to how you can get started in this guide. More in-depth information is provided in our magazine, as well as books and videos that are available through the SHOOT! Mercantile. If you don’t find what you need here or have any questions, please feel free to give us a call at (208) 368-9920 or e-mail us atinfo@shootmagazine.com and we will be glad to help you.